To create a mouthwatering gourmet smoothie or frappé, you need gourmet ingredients, so we place exacting standards on all of our beverage mixes. This means that all you need to think about is what your next signature drink will be. The only natural beverage brand with organic flavours in the specialty category, Cafe Essentials is the complete solution for those in search of better-for-you beverages. From luxurious frappés, to organic hot cocoas and rich vanillas, to spicy chai, Cafe Essentials is your complete natural, gourmet specialty beverage solution. Full of decadent flavour, you’d never know the mixes have less sugar, lower calories, and less fat than most other frappés. Each one offers a practically guilt-free indulgence any time of the day, making Cafe Essentials the perfect way to treat your customers to one of life’s simple pleasures. Learn more about Cafe Essentials here. 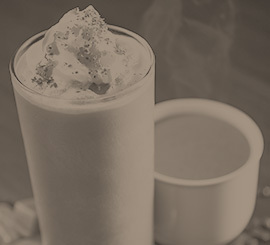 A leader in the frappé mix market, Cappuccine is paving the way with innovative and extremely popular flavours, backed by quality ingredients. 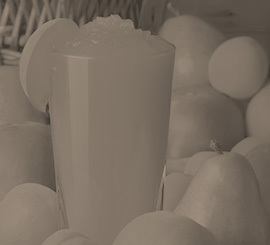 Since 1991, Cappuccine has been an innovator in the premium powdered frappé mix category. 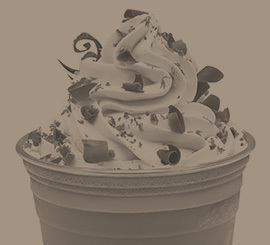 Winner of multiple awards including “Best Frappé Mix,” these decadent drinks couldn’t be more indulgent. Initially setting out to capture the bold coffeehouse flavour of authentic mochas and lattes in a refreshing blended beverage, the brand has now expanded to include an impressive list of unique mixes, from Red Velvet to Indian Chai and White Chocolate Symphony. Learn more about Cappuccine here. Since 1997, Dr. Smoothie has been passionately perfecting the art of making sensational tasting smoothies with 100% whole fruit and vegetables. Can you imagine making a fresh smoothie for every customer who wanted one? Dr. Smoothie makes it easier. Made from 100% real fruits and vegetables, with no artificial flavours, colours, preservatives, or high-fructose corn syrup, you can offer your patrons a whole menu of wholesome and healthy smoothies. Similar to the care we put into every one of our coffees, Dr. Smoothie cups every batch to assure the highest quality and best flavour. 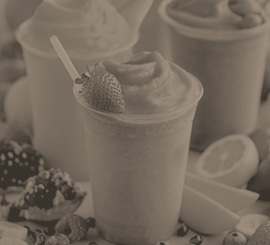 When it comes to taste and quality, they’re a leader in the premium smoothie mix market. Learn more about Dr. Smoothie here. Torani Real Fruit Smoothies, Fruit Purées and Frozen Beverage Blends offer irresistibly real fruit and coffee flavours that are also incredibly easy to use. When it comes to delicious frozen drinks, Torani doesn’t disappoint. Torani Real Fruit Smoothies are packed with real, sun-ripened fruit to achieve maximum flavour, plus they are all natural, preservative free and simple to use. Just pour over ice and blend. Torani’s shelf-stable Fruit Puree Blends and Coffee Blends offer limitless blended drink possibilities. Blend with milk, water, lemonade, juice, or alcohol and you can serve up a variety of frozen fruit or coffee drinks, like piña coladas or frozen lattes. Learn more about Torani here. With our selection of smoothie and frappé products, and accessories such as scoops and pumps, you’ll be able to offer your customers a wider range of flavours, and guarantee that the ratio you’ve created for your signature drinks is exactly the same every time.